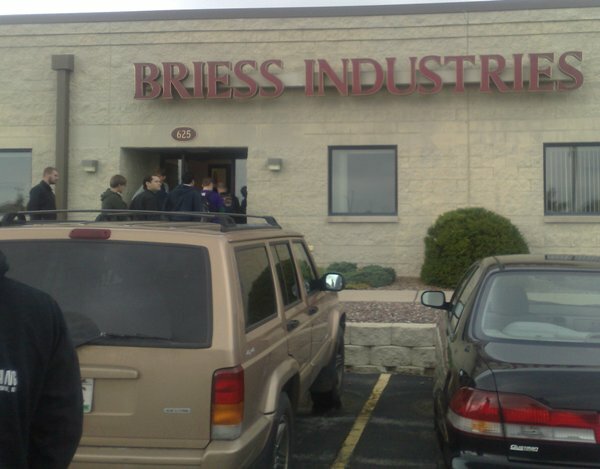 On Monday we hopped a bus to Chilton, WI for a private tour of Briess Malting. They don’t have public tours available, but their website is pretty awesome in terms of an online tour (see link below). A full tour of the Chilton Malthouse was fantastic, it was a lot of fun sticking my head into their steeping tanks, playing with germinating malt in my hands, and watching how they bag the final product. There is something very calming about the germinating rooms, it’s a nice cool temperature, there are these long tubs of moist barley in its early growth phase. I wanted to lay down and take a nap in a bed of grain. The lab was also pretty sweet, it’s bigger than my apartment and has all sorts of fun toys. The folks at Briess are all very cool. Midwestern accents are kind of funny, but the people are chill. Due to issues with proprietary processes and the like, they don’t let folks take photos inside the malt house, so all I have this is shot of the front of the corporate headquarters. They do have some photos on their site, including one of the basement of the malthouse with the ancient wooden supports for the entire building. It’s amazing that this malthouse was built over a century ago and is still operating as a modern specialty maltster. We spent quite a bit of time discussing how to use their products from their specialty malts to extracts. Like I said already, these people are cool and their passion for helping people produce good beer really comes across when you’re chatting with them about their products. We spent almost an hour just tasting various beers and discussing how the specialty malts were used to achieve some of the flavors in them. They have a 500 barrel brewhouse and can give some great insight into recipe formulation. In retrospect, I should have named this beer Double Nickels. I was cleaning out the videos from my cell phone and found this old brew lying around. That’s a 7.5 gallon kettle with 6+ gallons of homebrew wort boiling on my apartment stove.